Over the years i’ve used many different types of skincare. I did use mostly Clinique things. It was high end, but not too expensive. I used the Superdefense moisturizer SPF 20. As a night cream i used the Super Rescue Antioxidant Night Moisturizer. I did try the Clinique 3 step system with soap and moisturizer, but it never stuck. I still have a small Super Rescue tube, which i will use up in the coming months. A few years ago i started to read about skincare on blogs and watch more make-up and skincare youtube clips. Some recommended Dr. Jetske Ultee, a research physician in cosmetic dermatology. She has a list of recommended products (in dutch) on her site, which i now use as a starting point. It is hard though not to be tempted by all the beautiful selling talk which is thrown at you on the street, in the shops and online. For cleaning i mostly use warm water. Since i do not use make-up daily, water is enough for me. I do have a Body Shop Aloe calming facial cleanser and Aloe calming toner for when i do need to remove make-up, but i only use it once every two or three weeks. As day cream i now use the Olaz total effects day cream perfume free. It is a soft cream with hardly any smell which does get absorbed into the skin quickly. It leaves my skin feeling soft and fresh, just what i need. The Total Effects most important ingredient is Niacinamide (2). This cream will cost you around 20 euros, but the Kruidvat shop does have regular 50% discounts on this brand, so keep an eye out for that. 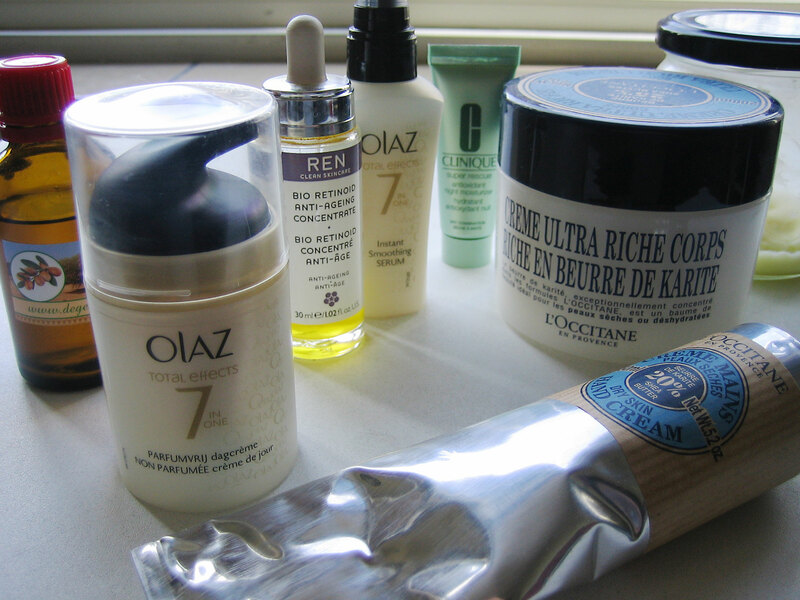 I also have a Olaz serum i irregularly use, the Olaz Total effects Instant smoothing serum. I did use Ren for a short time in between the Clinique and Olaz products. I did enjoy the feel and packaging of this brand. Sadly it’s getting a bit too expensive for me right now. I still have a Bio Retinoid anti-ageing concentrate i sometimes use in the evening. On the market i bought a pure argan oil for use on my face as well. I did stop using a dedicated night cream all together. I use the oil now sometimes. I could use my day cream as a night cream, since it doesn’t have an SPF in it. This was also a conclusion i reached after reading about on the blog of Dr. Jestke Ultee. There are two more product types i will start using soon. First it is an exfoliant. I should read more about the two different types – salicylic acid and glycolic acid – and make an informed choice. My skin seems fairly normal to me, not overly oily or dry. I do get a red face quickly though, so i think i have a sensitive skin. It seems that salicylic acid is the best for me, since it’s a bit milder and suitable for a sensitive skin. The other product i want to start using is a sun protector. This does coincide with the exfoliant, which makes your skin more sensitive to sunshine, since your upper skin layer will be thinner. I will go through the list on the product advice page and will pick an affordable one out to start with. I did find my favourite hand cream of all time, the L’Occitane Shea Butter Ultra Rich Hand Cream. I use a bit in the morning and a bit in the evening, rubbing it into the upper side of my hands. It’s a wonderful thick cream, with a faint honey and almond smell. I just bought my second tube of this stuff. I simply don’t wanna use anything else. I was tempted and bought a Shea Butter Body Cream as well. It is wonderful stuff. Yes, the price is a bit high, 33 euros for 200 ml. I will go back to making a homemade body butter. I do like the idea of knowing all the ingredients in what i use. It’s also pretty easy to make it yourself, you only need a few ingredients. A year and a half ago i went to drugstore de Lang in Rotterdam to buy the ingredients for this butter. Soon i will go back there and get more ingredients. Just a short trip with the tram is all i need. Or… i could go for a walk! I do feel the products i use are fairly basic. But i admit, i do love a bit of pampering. I do not use the body butter each day. I do use it around twice a week on my arms and legs. I try to show a bit of restraint in the products i use. But yeah, i do get tempted! I am curious about using an exfoliator. I have never used it, so i will make my skin get used to it slowly. I’ll keep you informed about my experiences with it. For Dutch people, the website of Dr. Jetske Ultee is a great resource. I’m afraid i do not know any similar site in english, or any other language. If you do know any such site, with clear and precise information about beauty products, please share that in the comments below.